Elinor Barker says she is still in shock after Great Britain won their first gold medal of the 2013 World Track Cycling Championships. 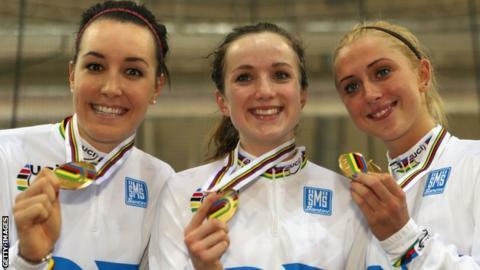 The teenager, alongside Olympic women's team pursuit champions Laura Trott and Dani King, beat Australia in Belarus. They clocked three minutes 18.140 seconds to beat Australia's Annette Edmondson, Ashlee Ankudinoff and Melissa Hoskins by 1.773 secs. "It's a big shock. It hasn't really sunk in yet," 18-year-old Barker said. Barker won the junior world time-trial title at the Road World Championships last September and was thrilled with adding a senior track crown. "The junior time-trial was expected. I had been working towards it for a whole year," said the Cardiff schoolgirl, who has been continuing her biology and PE studies while in Minsk. "I've done a lot of team pursuit work, but always with a view to being the best that I can be, rather than being the best in the world." The event was added to the World Championships programme in 2008 and Britain have won every time apart from in Copenhagen in 2010. Trott and King are unbeaten in the three-woman, three-lap event since February 2011, when part of a junior British team at the Manchester Track World Cup. Barker teamed up with Trott and King after Joanna Rowsell opted to focus on the road after winning gold at London 2012. The event is poised to increase to 4km and four riders after this competition, and King believes Barker will be an integral member of the squad for years to come. "She's going to be a key part of the team in the future," King said. "We just work really hard and come together as a team. We ride as one, not three individuals. "We've got so much trust in each other and belief. That's key, every time we get on the line."